A few technical and dialogue hiccups annoy, but overall TWD continues to be one of the best stories in gaming. Finishing an episode of The Walking Dead is the same feeling I get flipping the final page of a novel. It's a confluence of resolution and reflection, a slow-developing brain Polaroid that's handed to you after a flash of gameplay. TWD's episodes are just two hours and change, but I think that brevity's an asset for gamers (and gaming editors) that don't have a lot of time on their hands. It feels great to finish something in a single sitting. Don't fret! Our review is spoiler-free. One of my favorite aspects of the series' introductory episode was the way it managed to explore new territory while echoing TWD's themes. We met the main character, Lee Everett in the backseat of a police car, instead of as a policeman. He has to protect a child, but the child isn't his. Starved For Help is slightly less successful at that, partly because it sends the cast to a location that—even with variations on the situation and cast composition—is very familiar. That's also true of the problems faced: security, food, and how to interact with other survivors. To anyone that's a fan of zombie fiction, Episode 2 feels like Apocalypse 101; it retreads some of the lessons learned by the comic book and TV show cast, which makes the ep. feel a little less like its own, original journey. There's a deficit of newness in that regard, but the story itself and the presentation of tough decisions are both handled well. None of the “this is a moment where you can die” gameplay sequences from Episode 1 are repurposed, and a particularly-tense one has you using a moving object for cover. The performances are generally great, too. Terry McGovern's voicing of TWD's always-angry Larry managed to make me sympathize with a character that did nothing but hate me. A few things do get telegraphed by the dialogue, including the terrific climax of the episode. This is a delicate thing—Telltale has a need to build suspense and give hints, but there were a few instances where exposition was inches outside of feeling natural. The worst offense was when one party member suggested “Don't wait too long to help scope out [location]. It'd be a good opportunity to find out a bit more about [character] and their relationship to [other character], or whatever.” There're also moments of dialogue that feel like sudden mood swings. In one instance, a party member accused me of not supporting him when that's all I'd done in the previous episode. Minor technical issues like frame stuttering are still here, too. I had to implement a weird solution—running the game in Win98 compatibility mode—on my home PC (but not my work PC) to get it to start. Limitations of the engine were also more apparent to me in this episode. All thresholds—doors, gates, and so on—have to be clicked on to cross; it's a noticeable shortcoming of the engine that I can't just use the motion of my character to walk through a gate in an outdoor scene. Stealth sections animate also awkwardly: you press W—and only W—to move forward on an invisible rail. This is a pile of small complaints, though. 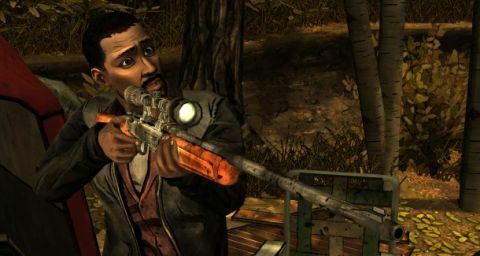 They reflect why I like the second episode less than the first , but Telltale is still producing one of the most captivating, interesting, and relatable stories in gaming. Ep. 2's ending is a wonderful payoff, and Telltale threw a ton of unique animations and custom lighting into a drama-dense, minutes-long finale.